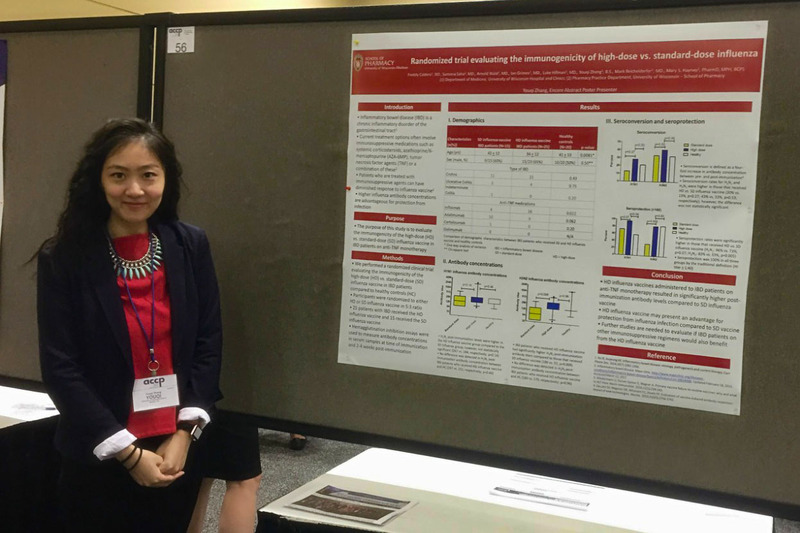 PharmD student Youqi Zhang at the 2018 ACCP Global Conference. 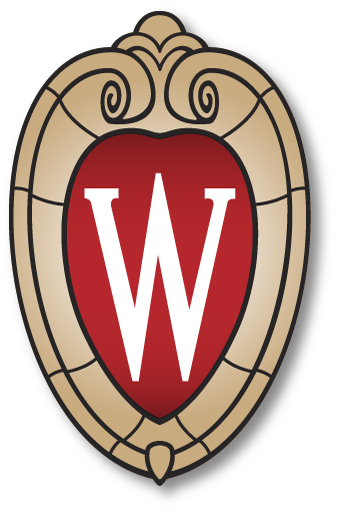 As a second-year PharmD student at the University of Wisconsin–Madison School of Pharmacy, Youqi Zhang started to become more curious about the role of pharmacists, and the more she learned, the more the wanted to know. Zhang started seeking her answers in the lab of Mary Hayney, a professor in the School of Pharmacy’s Pharmacy Practice Division, and spent her next three years of pharmacy school conducting clinical research to improve the immunization strategies for patients with inflammatory bowel disease. All told, Zhang spent 450 hours forming research questions, collecting and analyzing data, and writing a manuscript to share her findings. Her high-quality and significant research, along with that of six other PharmD students from the School, was chosen for presentation at the 2018 Global Conference on Clinical Pharmacy, hosted by the American College of Clinical Pharmacy (ACCP), and also earned her a travel award from the ACCP GI/Liver/Nutrition Practice and Research Network to attend the conference. Through the School of Pharmacy’s new Pathway of Distinction in Research, Zhang’s research accomplishments will also be officially recognized at her graduation and through documentation she can carry forward to future opportunities. Zhang is one of five students in the PharmD Class of 2019 who will be receiving the new distinction. Research-minded future pharmacists can apply to the Path of Distinction in Research beginning in their second year of the PharmD program and then will complete 12 research credits, which equates to 540 hours, under the direction of a faculty research mentor through independent study credits, a research-focused Advanced Pharmacy Practice Experience, or a summer research fellowship. Mel de Villiers, professor and associate dean for academic affairs, and Mary Hayney, professor in the Pharmacy Practice Division. Students’ projects can focus on the basic sciences, clinical applications, or the outcomes or implications of pharmacy services, but they must be cohesive and culminate in a manuscript for submission to a peer-reviewed, indexed journal. To earn the distinction, the students will also have to complete a number of other activities, such as presenting their research at a local and a regional or national meeting. Because the Pathway of Distinction is new, PharmD students graduating in 2019 and 2020 who have demonstrated a commitment to research and have submitted a publication — like Zhang — will be grandfathered into the program after a faculty review of their work. In addition to student recognition, the Pathway of Distinction in Research was also created in response to the number of PharmD students interested in pursuing substantial research, says Mel de Villiers, professor and associate dean for Academic Affairs. “Over the years, research has always been one of the top reasons that future pharmacists choose the School of Pharmacy,” says de Villiers. By creating this pathway, the School is developing infrastructure to make research opportunities easier for students and lays the groundwork for more future developments. The introduction of the Pathway of Distinction in research is part of a larger effort — including the new Pharmacy Operations and Technology Management PharmD concentration — to allow PharmD students to tailor their experience and education to help them reach their professional goals faster. “Any future position will be enhanced by experience with research, because our students will have demonstrated strategies for determining what the real question is and finding logical and thoughtful ways to answer it,” says Hayney. Read about the six PharmD students’ research chosen for presentation at ACCP’s 2018 Global Conference. Learn about another innovative offering in the PharmD program: the Pharmacy Operations and Technology Management option.